Chile has always had a tradition of protecting childhood. Since the mid-20th century, our approach acquired greater depth and intensity as a response to rising concern and a greater awareness of the issue across the world. Protection was focused, however, on trying to alleviate major food shortages and gaps in healthcare by providing supplementary food, vaccinations and basic medical care. It is now 58 years since the United Nations adopted the Declaration of the Rights of the Child, and 28 years since the same organisation gave its approval to the Convention on the Rights of the Child (CRC), a text ratified by Chile in 1990. This means that 27 years ago – just a few months after democracy was restored – our country took on a clear and firm commitment to early childhood as an integrated and cross-cutting policy, picking up the four fundamental principles of the Convention: non-discrimination; the best interests of the child; the right to survival, development and protection; and having a say in decisions that affect them. We have taken important steps to fulfil that commitment. 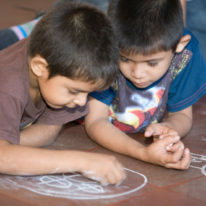 Some of the biggest milestones can be seen in the Ley de Filiación of 1998, which put an end to the dreadful difference in legal status for children born outside marriage, and the introduction of new judicial proceedings in the family justice system in 2004 along with legislation for adoption that safeguards children’s interests, enabling them to live in a home where they feel loved and protected. 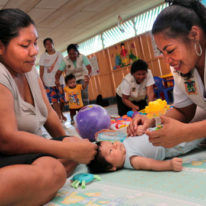 Undoubtedly one of the most significant milestones in ensuring that all boys and girls reach their full developmental potential came a decade ago, with the emergence of the ‘Chile Crece Contigo’ (‘Chile Grows With You’) system – the first systematic, inter-sectoral, structured policy for protecting early childhood rights was drawn up, with prenatal monitoring for mothers followed by an initial scope from birth to 4 years of age, which we have recently extended to age 9. The CRC calls on states to protect and promote children’s full set of rights, by accompanying them throughout their development and taking action with specific protection or reinforcement measures when required. A task like this calls for a multidimensional response, one that can coordinate and strengthen the work done by different sectors, one that transcends presidential terms of office, setting itself up as a commitment to children undertaken by the state, rather than by any one particular government. In other words, what we did was change our approach to working with early childhood. So, instead of each sector doing things their way, efforts were joined up, new programmes and benefits were created, community networks were put in place and we began to work differently with children. We started by monitoring mothers’ pregnancies, carrying out healthy child check-ups, providing support for children’s overall development and designing specific interventions, mainly in health, education and justice issues. This change of paradigm, originally often regarded with suspicion, is now understood as being essential. Nowadays no one has any doubts about the importance of stimulation in the early years of a child’s life. Today we all agree on the key issue of early detection when a child is falling behind, so we can act in time. Today nobody is surprised by the fact that the best investment that a country can make is in early childhood, tackling inequality at its roots by addressing the differences that separate population from infancy. We have seen concrete results. In the last ten years, nearly 2 million pregnant mothers were part of our parental monitoring scheme; we’ve encouraged the mother’s partner or another family member to be present at the birth, and that now happens in six out of every ten cases; more than 1,600,000 boys and girls were born and protected by the system, and more than a million packages of clothes and other essentials were given to babies born in the public system. Skin-to-skin contact for half an hour or more after birth is on the rise, reaching 76.3% in 2016. Plus, exclusive breastfeeding up to the sixth month also increased to 56.1% in 2016. But we obviously have to go further than birth. Healthy child check-ups and monitoring children as they grow help to detect signs of developmental delay and allow us to refer them to specialists for specific forms of stimulation. Thanks to this, 42% of children who were found to be falling behind have now caught up. 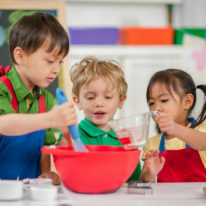 Attending nursery school offers opportunities for development, and the net rate of nursery school attendance is 90% among children aged between 4 and 5. The most significant progress between 2006 and 2015 was in children from birth to 3 years: in 2006 the net attendance rate for this age group was 16.4%, and by 2015 it was 30% (Ministry of Social Development, 2016). This is undoubtedly good news, especially at this moment, as we are in the process of expanding coverage provided by the system to children aged from 5 to 9. This expansion is being implemented along two new lines. First, through the mental health support programme, which will provide treatment for boys and girls aged between 5 and 9. We started running it in 23 municipalities and gradually extended it to benefit 18,600 children between 2016 and 2017. The second line of action is the integrated learning support programme, which uses stimulation and creativity tools like the ‘Games Corner’, which we are giving to all boys and girls of pre-kindergarten age in state-run schools and nurseries. Simultaneously we will reinforce current programmes and add new interventions until we can cover all boys and girls between the ages of 5 and 9 who go to state-run schools in our country or who receive treatment in the state healthcare system. "Undoubtedly one of the most significant milestones in assuring that all girls and boys reach their full developmental potential came a decade ago with the emergence of Chile Crece Contigo." Although the system has now been developed across the whole country and is producing significant results, there are still challenges we must tackle. One of them is guaranteeing that the system operates at optimal level in each of the municipalities across the country, as there are still difficulties in delivering the service in the most appropriate and timely way. There are also structural issues connected with inequality, poverty and violence that lead to stressful situations that mothers, fathers and carers find very difficult to cope with and that have a negative impact on children’s development. Of these three, poverty is showing signs of steadily lessening across the country, but it is still higher in families with children than in the rest of the population as a whole. The pressure of these structural factors on children’s lives means we must break the traditionally isolated nature of early childhood policy. So, our challenge at present is to join up early childhood policy with the country’s more general development policies. Likewise, developing and continually improving the system requires interventions with high levels of specific expertise. 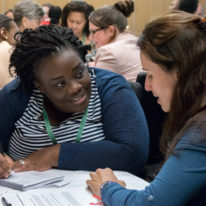 Taking on board the latest advances in early childhood knowledge and strategies involves implementing good-quality continuous training as well as teaching specific skills not normally covered in pre-university training courses. This requires input from cross-sector working networks and ongoing specialised technical assistance. We also know that any social policy is constantly being refined, so that it can be managed more efficiently and effectively. This involves focusing on users, simplifying processes, instruments and access for the community, monitoring transparency in the way we use and assign resources, and promoting participatory processes. On this point, an important tool like the registration, referral and monitoring system run by Chile Crece Contigo must increase its information management capacity. It can do this by starting to use predictive or beneficiary segmentation models to forecast the appearance of risks, in terms of lifestyle, so that alerts can be issued and the right kind of services can be provided at the right time. 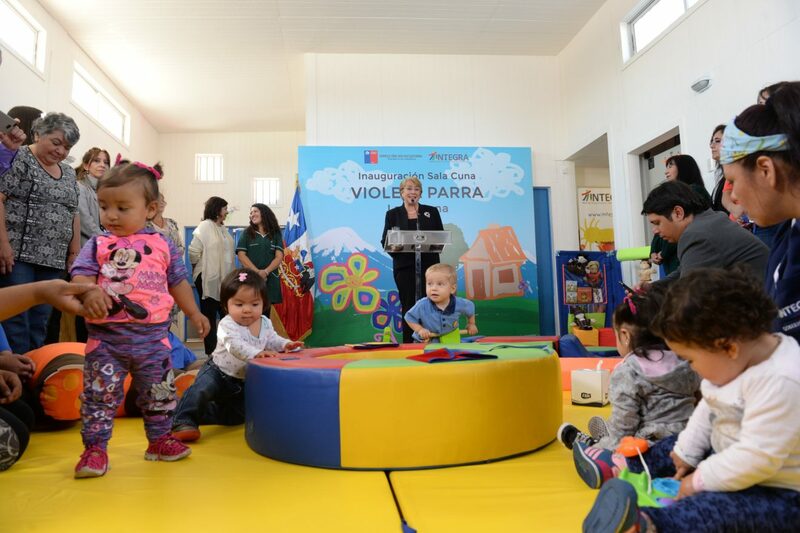 Chile Crece Contigo will form the operational basis of the future Childhood Rights Guarantee System, with which we expect to cover the entire population aged under 18. In addition to reinforcing what is already up and running, this involves putting new sub-systems in place for other age groups. For the efficient execution and effective results we need a modular outlook. As Mary Beloff says, integrated childhood protection systems are ‘a model for building’ in which the pieces of a whole are gradually slotted into a large-scale system (Beloff, 1999). The Chile Crece Contigo experience shows that this takes both time and specific institutional support. In the Ministry of Social Development, by the end of this administrative term (March 2018), we will have set up a cross-ministerial committee on social and childhood development with the office of the Undersecretary for Childhood from which Chile Crece Contigo will continue to be managed. Alongside this, boys and girls will have their own Children’s Watchdog, an independent body that will ensure children’s rights are respected, promoted and protected by the State. "We’ve encouraged the mother’s partner or another family member to be present at the birth, and that now happens in six out of every ten cases."